‘Celebrate Food’ is the opening proclamation of Hog Heaven sauces. Hog Heaven is created for ‘Foodies’ and is ‘A Sauce for Life’. All we care about is does it taste good? This is the million dollar question we will answer today. Hog Heaven is a company run by Ira Pupko. He is well known in Southern California competition bbq circles. Ira has used his barbeque skills and knowledge to create several, fat free, all natural, preservative free and gluten free bbq sauces. 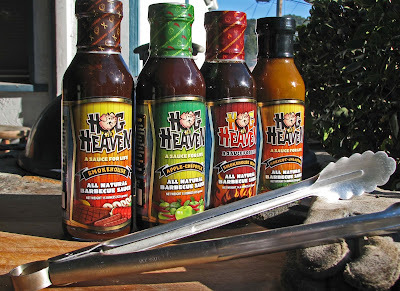 His line of Hog Heaven sauces has several different flavors; Apple Chipotle, Apricot Jalapeno, Original Smokehouse, and Smokehouse Heat. We will try the bold Original Smokehouse on some beef ribs cooked on our new 14.5 Weber Smokey Mountain Cooker. I cannot wait. Let’s fire up the grill. Tomato paste molasses, sugar, distilled vinegar, water, natural smoke flavor, salt, contains less than 2 % each of the following, onion powder, black pepper spices, cayenne pepper are the listed ingredients. Smoky tomatoes and molasses leaps from the open bottle top to say ‘Hello’. The barbeque has started even though we have not even lit the fire. The aroma is pleasant. This is a very thick, dark, smooth sauce that pours freely from the bottle. This is a well balanced sauce. 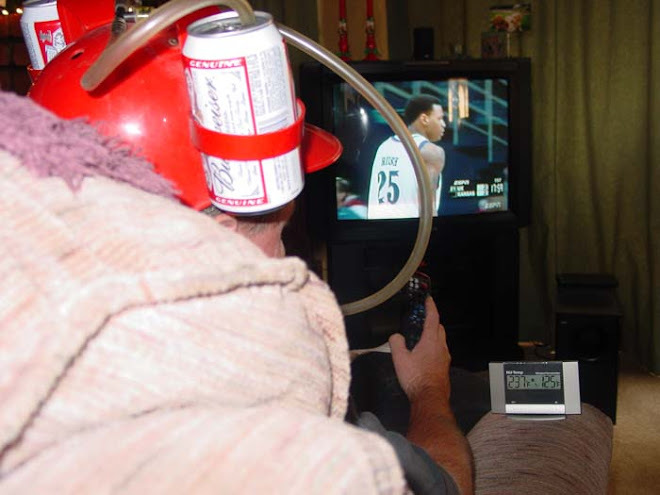 I was a little concerned that the smoke would overpower. This was not the case. The components, tomatoes, sugar, molasses, vinegar, and natural smoke meld together forming a serious bold flavor. This flavor screams barbeque and I am hungry. Chilebrown has a brand new Weber Smokey Mountain Cooker. We have been having a lot of fun cooking various meats to break in this new smoker. 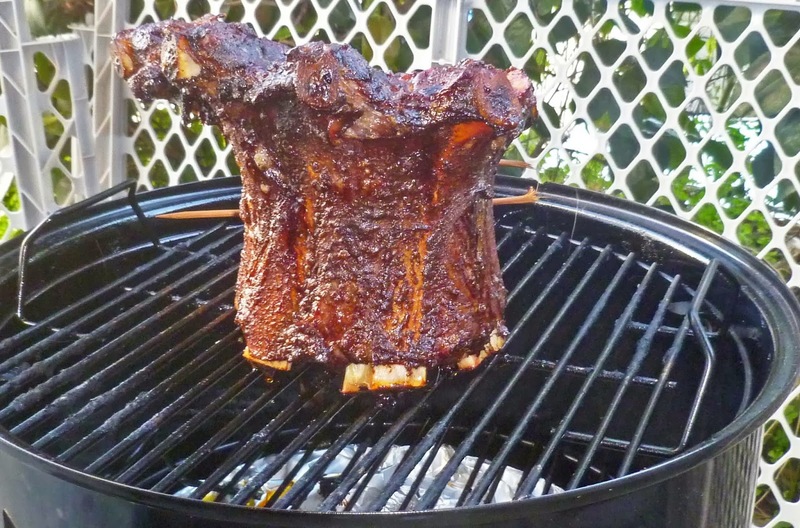 Beef ribs would be smoked for approximately three hours to a very tender and succulent state. 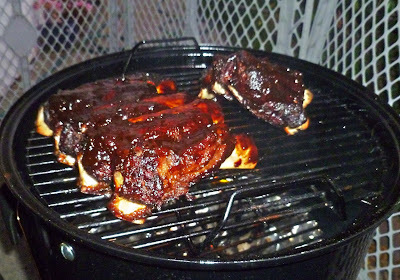 We smothered the ribs with the ‘Smokehouse’ sauce and returned them to the smoker for several minutes to set the sauce. Have you ever seen a grown man cry with tears of happiness? 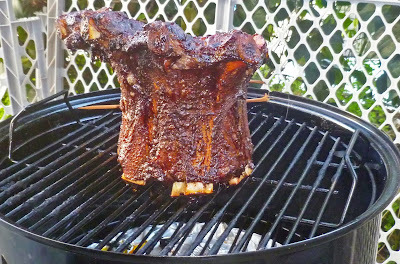 We were in beef rib nirvana. 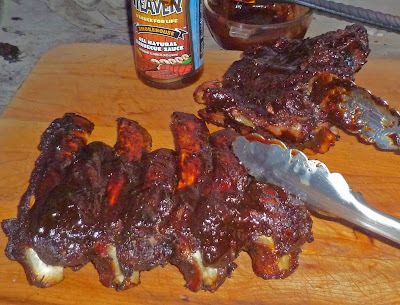 This sauce is bold and stood up to the rich juicy ribs. It added sweetness with the molasses. The vinegar added a freshness to perk up the flavors to greatness. This was barbeque flavor that we love. Houston we have a lift-off. Hog Heavens Smokehouse bbq sauce is a bold sauce with smokey molasses and tomato flavor. It was perfect for our beef ribs. It would be a good match for any beef cut that you wanted to barbeque. I believe this sauce would be good to flavor a pot of bbq beans. 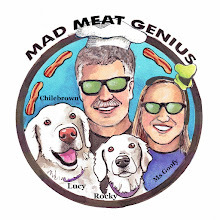 Ira Pupko of Hog Heaven Sauces has created a sauce that the Chilebrown household proudly endorses. We cannot wait to try the other flavors. Three Dogs BBQ, I still need to do a brisket to break in the 14.5 WSM. We have been having fun breaking it in. Brilliant! Your photos and food always make me hungry. That rack of ribs is killer!